Not to be confused with Bollywood. Approx 500 in Maharashtra state of India. Marathi cinema refers to Indian films produced in Marathi, the language of the state of Maharashtra, India. Based in old Mumbai, it is the oldest and one of the pioneer film industries of India. 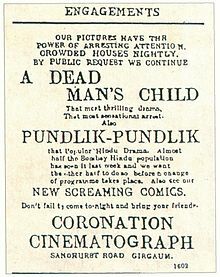 The first Marathi film to be released in India was Shree Pundalik by Dadasaheb Torne on 18 May 1912 at Coronation Cinematograph, Mumbai. and a Marathi crew who were performing Marathi and Sanskrit Sangeet natikas (musicals) and plays in Marathi at that period. The first Marathi talkie film, Ayodhyecha Raja, was released in 1932, just one year after Alam Ara the first Hindi talkie. Although the industry is much smaller than the large market driven Hindi cinema based in Mumbai, Marathi cinema is tax free, and is experiencing growth in recent years. 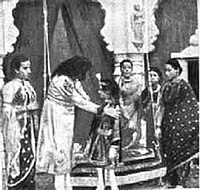 Raja Harishchandra, directed by Dadasaheb Phalke, was a Marathi film, now known as India's first full-length feature, released in 1913. The Dadasaheb Phalke Award is India's highest award in cinema given annually by the Government of Maharashtra for lifetime contribution to Indian cinema. Marathi cinema is the oldest form of Indian cinema. The first Marathi movie released in India was Shree Pundalik by Dadasaheb Torne on 18 May 1912 at Coronation Cinematograph, Mumbai. Dadasaheb Phalke is known as the first pioneer and founder of cinema in pre-Independence India. He brought the revolution of moving images to India with his first indigenously made film Raja Harishchandra in 1913, which is considered by IFFI and NIFD as part of Marathi cinema as it was made by a Marathi dialogues while shooting and fully Marathi crew. Kolhapur in Western Maharashtra was another centre of active film production in the twenties. In 1919 Baburao Mistry — popularly known as Baburao Painter — formed the Maharashtra Film Company with the blessings of the Maharaja of Kolhapur and released the first significant historical Sairandhari (1920) with Balasheb Pawar, Kamala Devi and Zunzarrao Pawar in stellar roles. Because of his special interest in sets, costumes, design and painting, he chose episodes from Maratha history for interpreting in the new medium and specialised in the historical genre. Baburao Painter made many silent movies till 1930. However, after a few more silent films, the Maharashtra Film Company pulled down its shutters with the advent of sound. Baburao was not particularly keen on the talkies for he believed that they would destroy the visual culture so painfully evolved over the years. As cinema grew in Union of India, major production houses rose and one of them was again a company owned wholly by Maharashtrians, the Prabhat Film Company. Prabhat's Sant Tukaram was the first Indian work to win the Best Film Award at the Venice film festival in 1937. In 1954 at the very first edition of the National Awards, Shyamchi Aai another Marathi film, won the first President's Gold Medal for Cinema. It was directed by Acharya P K Atre, and it was an adaptation of the eponymous novel by Sane Guruji. Marathi cinema was in its full bloom by this time with the advent of greats like V. Shantaram, Master Vinayak, Bhalji Pendharkar, Acharya Atre, followed by Raja Paranjpe, Jyotiram,sonal and mumtaz, Dinkar D Patil, G. D. Madgulkar, Sudhir Phadke , Raja Thakur . The 1960s saw the emergence of directors like Anant Mane who made Marathi films based on the folk art form Tamasha. Then came directors like Datta Dharmadhikari and Raj Dutt who made traditional family dramas. The early 70s saw the advent of Dada Kondke who captured the audiences with his sense of humour. He went on to create satirical, pun-ridden films often including social and political commentary, many of which became cult classics. By this time Marathi cinema was caught in either the Tamasha genre or tragedies revolving around traditional family dramas on one side and the comedies of Dada Kondke. The 1980s saw two comedy heroes catapult to stardom, Ashok Saraf and Laxmikant Berde. Around the mid-80s two young actors donned the director's mantle: Mahesh Kothare and Sachin Pilgaonkar. Pilgaonkar directed Navri Mile Navryala and around the same time Mahesh Kothare directed Dhumdhadaka. Pilgaonkar's film was a box-office hit while Mahesh Kothare's became a mega hit at the box-office, became a trend-setter, and brought young audiences to Marathi cinema. Mahesh Kothare went on to make comedy films that became major hits. He made the first Marathi film shot on the anamorphic format (Cinemascope) — Dhadakebaaz. He brought a number of innovations in the technical quality of Marathi films and was the first to bring Dolby Digital sound to Marathi cinema with Chimni Pakhara. He made the first Marathi film with Digital Special Effects, Pachadlela, in 2004. He also made first Marathi movie in 3D Zapatlela 2, in 2013. The 3D of this film was highly appreciated and technically this film was extremely well made. This film also went on to become a blockbuster. Currently Mahesh Kothare is working on Zapatlela 3. This for the first time that a franchise has emerged in Marathi cinema. While the theatre of Maharashtra earned recognition at the national level, the cinema failed to make a mark. A major reason was the proximity to the production centre of Hindi cinema (Bollywood), which encroached on the identity of Marathi cinema. Other reasons include the shortage of cinema halls for distribution due to poor marketing, lack of money magnets, a vibrant theatre scene and the emergence of private television. It also lacked the powerful lobby at the national level unlike Bengali and South Indian cinema because state congress (ruling party over 40 years) encouraged Hindi cinema for profit mainly; the regional film industrial advantage being soaked up by Bollywood. In past few years, the Marathi cinema industry has produced many films that are not only critically acclaimed but commercially successful as well. It has brought fresh ideas, untouched subjects and deeper human sensitivity on the celluloid. Acclaimed director Dr Jabbar Patel explains the reasons behind the change, "The kind of Marathi cinema that is being made today is very fresh and different. This is thanks to directors and writers getting exposed to world cinema via television, film festivals etc. They are coming up with new storylines and innovative concepts." Actor Mrinal Kulkarni remarks, "There is a lot of content and variety in Marathi films. A lot of bold subjects have been handled well by them. They carry a lot of substance." But, she adds, "We need to start watching a lot more Marathi films. Until we see the films ourselves, we will never be able to appreciate them when they are sent to the Oscars." With outstanding contribution and efforts from different producers and directors of the Mumbai film industry, Marathi cinema relatively outshined other Indian film industries such as Bollywood in the first quarter of 2010 in box office collections and critical appreciation. Marathi cinema received critical acclaim in 2004 with the film Shwaas winning the Golden Lotus National Award. It was India's official entry to the 77th Academy Awards. It won the President's medal for best film, beating Bollywood's prolific output with quality. Shwaas was the second Marathi film to win the President's Medal after Shyamchi Aai (1950). The Maharashtra state government has begun to issue grants to Marathi film (between 1.5 million and 3.0 million rupees). After the success of Shwaas, Indian media players like Shringar Films and Zee Telefilms are exhibiting a re-emerging interest in Marathi cinema. The growing popularity of Marathi television (notably Zee Marathi and ETV Marathi) has helped to popularize older Marathi cinema and promote the genre. Zee Talkies, a 24-hour channel dedicated to Marathi movies, has been introduced. In 2009, Marathi film Harishchandrachi Factory (with a budget of Rs. 6 crore), depicting the struggle of Dadasaheb Phalke in making Raja Harishchandra in 1913, India's first feature film, directed by theatre-veteran Paresh Mokashi was selected as India's official entry to Academy Award in the Best Foreign Language Film category, making it the second Marathi film, after Shwaas, to receive this honour. 2009 saw the blockbuster musical movie Natarang, which both commercial and critical applause and has served as a path-breaking movie for Marathi cinema. Since the new decade beginning in 2010, several contemporary Marathi artistic films released including Umesh Vinayak Kulkarni's Vihir and Deool, and Nagraj Manjule's Fandry. They have given a new direction to Marathi films. Sairat (2016) musical romantic drama starring Rinku Rajguru and Akash Thosar, directed by Nagraj Manjule and produced by Nagraj Manjule, Nitin Keni, and Nikhil Sane emerged as the biggest weekend opener for a Marathi film breaking record previously held by Natsamrat. Sairat was the first Marathi film to cross ₹50 crore (US$7.8 million) mark. The film has become the first Marathi film to gross over ₹100 crore (US$16 million) worldwide. Also it ran for more than 100 days in many centres of Maharashtra. 1985 op Dhoom Dhadaka Mahesh Kothare (Dhoom Dhadaka) Laxmikant Berde ?? Nowadays Marathi movies have been listed at lots of International Film Festival and All lights Film Services, which provides a platform for such movies and the film makers to know big in the world film industry.All Lights Film Services  provided platform for various famous Marathi Films such as PINKY – Ek Sathyakatha, Kapus Kondyachi Goshta,Hou De Jarasa Ushir, Sopanchi Aye Bahina Bhai,Touring Talkies,Langar to almost all leading International Festivals across the world including Oscar. Marathi Cinema: In Retrospect, by Sanjit Narwekar. Maharashtra Film, Stage & Cultural Development Corp., 1995. ^ "STATEWISE NUMBER OF SINGLE SCREENS". Film Federation of India. Retrieved 21 April 2014. ^ "Films of Prabhat Film Company". Retrieved 12 June 2007. ^ "Marathi cinema can surpass Hindi cinema". Yahoo. Archived from the original on 12 February 2010. Retrieved 2 December 2010. ^ "History of Regional cinema". Cinemaofmalayalam. Retrieved 2 December 2010. ^ "Baburoa Painter". Upperstall. Retrieved 2 December 2010. ^ Pate, Niel (28 September 2004). "Marathi cinema: Waiting to exhale". The Times Of India. ^ a b Rajadhyaksha, Mukta (29 August 2004). "Marathi cinema gets a shot in the arm". The Times Of India. ^ Kale, Pramod (1979). "Ideas, Ideals and the Market: A Study of Marathi Films". Economic and Political Weekly. 14, (35): 1511–1520. JSTOR 4367902. ^ "National Film Awards, India: 2004". Retrieved 12 June 2007. ^ "Shwaas is India's Official Entry to Oscars". Retrieved 12 June 2007. ^ 'Harishchandrachi Factory' India's entry for Oscars Indian Express, PTI 20 September 2009. ^ Harishchandrachi Factory to tell story behind making of India's first feature film Archived 30 September 2012 at the Wayback Machine, Indian Express, Express News Service, 3 May 2008. ^ 'Harishchandrachi factory' India's entry for Oscars[permanent dead link] Press Trust of India, 20 September 2009. ^ "'Go Global' with All Lights Film Services". indiantelevision.org.in. 18 December 2013. ^ "'Sairat' box office collections: At mammoth Rs 125.00 crore, movie creates 'history". financialexpress.com. Times News Network. 11 May 2016. Archived from the original on 12 May 2016. Retrieved 11 May 2016. ^ a b N, Ganesh (11 April 2015). "Struggle for success: Marathi films lose out in the multiplex race as popcorn-loving movie-goers prefer Hindi and English blockbusters". Daily Mail. ^ "Priya thanked her audience - The Times of India". Timesofindia.indiatimes.com. Times News Network. 28 May 2015. Retrieved 24 August 2015. ^ Deshmukh, Gayatri (31 July 2014). "After Duniyadari, will Lai Bhaari break Timepass' record?". The Times of India. ^ Ganesh N (11 April 2015). "Struggle for success: Marathi films lose out in the multiplex race as the popcorn-loving movie-goer prefers Hindi and English blockbusters | Daily Mail Online". Dailymail.co.uk. Retrieved 24 August 2015. ^ "Why Bollywood is jumping on the Marathi cinema bandwagon". mid-day. 25 August 2014. ^ "Monetary boost giving Marathi cinema a new lease of life? - Entertainment". Mid-day.com. Retrieved 24 August 2015. ^ "Here's why Marathi cinema is doing better than Bollywood - Entertainment". Mid-day.com. Retrieved 24 August 2015. ^ "A mixed first half for Marathi cinema". Afternoondc.in. 6 July 2010. Retrieved 24 August 2015. ^ "Son of the Soil Rising". intoday.in. This page was last edited on 28 December 2018, at 03:19 (UTC).